I remember sitting inside a cramped van negotiating the snaking countryside road of Laos, feeling very excited as I reached my next destination. My high anticipation stems from the desire to unlock the truth behind the prevailing word-of-mouth on Luang Prabang. “The place is so laid-back,” fellow travelers would often rave. As simple as it may be, that description is music to my ears. Throw in the heritage structures and rich culture of the city, my giddiness got the best of me for the rest of my ride. Not to be disappointed, the moment the van dropped me off at the Historic Center of Luang Prabang, I instantly felt the old-world vibe. The imposing grandeur of the Royal Palace promptly satisfied my fondness for tasteful architecture. 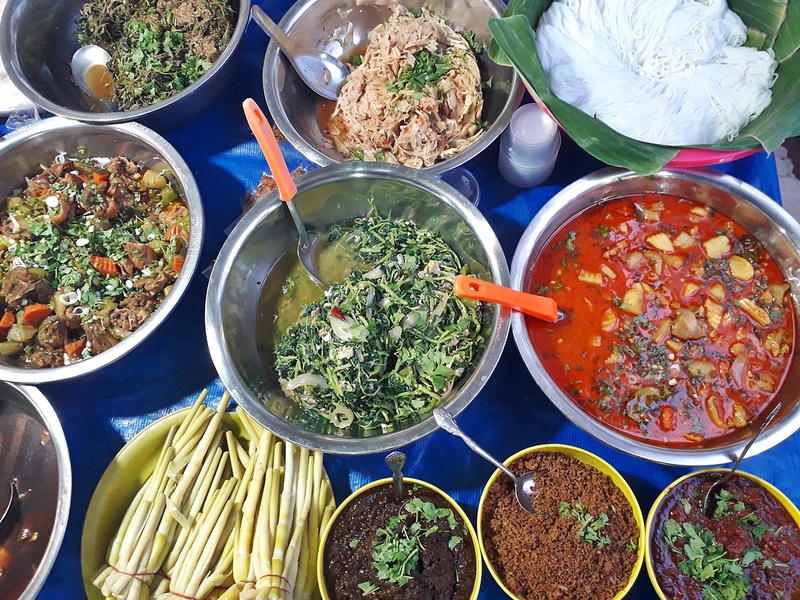 As the sky turns red and on the verge of giving way to darkness, the night market stalls began popping up one by one, gradually lighting up the streets. Soon, the crowd thickens but I didn’t mind, as I gleefully continue my exploration on foot. Like a kid in a candy store, I stared with wide-eyed in wonder at the surrounding shops, restaurants and cafés—all housed inside the colonial-era establishments. Channel out the patrons busy fidgeting on their mobile phones, and you’d feel like you’re back in the prewar decades. Monasteries, palaces, temples (or wats) and colonial houses abound in the pedestrian-friendly district of Luang Prabang. You could very well explore the whole place in a day, but who would want to sightsee in such haste? Definitely, not me. 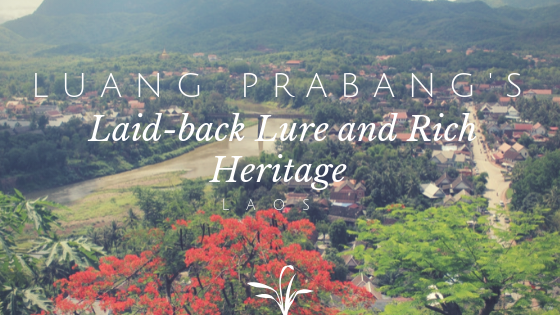 The charming vibe of Luang Prabang beckons, so I ended up staying for several days. On the first morning, I woke up early to witness the morning practice of the monks asking for alms. Also known as the “Tak Bat,” this daily ritual has become an important part of Luang Prabang’s culture. However, it has generated controversy in recent years, when tourists began participating and giving away nonedible items such as money. With respect to their culture, it is more appropriate to let the locals and devotees of Buddhism be the donor and for tourists to politely keep a safe distance from the monks. Still, the experience of witnessing this ritual added a new layer to my spirituality, as I understand how the monks envisioned it to be—a practice in humility and detachment from earthly possessions. This humbling sight instills generosity and kindness that can never go wrong. 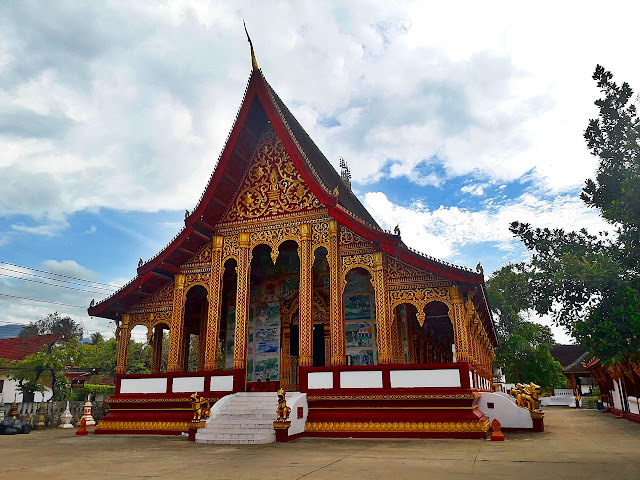 With more than a dozen centuries-old temples built around Luang Prabang, you will never run out of ways to observe how Laotian people and the monks practice their faith. I started off at the Wat Xieng Thong, a 16th-century temple built by King Setthathirat. Inside its walls, one can find intricate artworks depicting Laotian life, culture and religious practices. It is one of the most important landmarks in Laos because it was here where some of the earliest Laotian kings were crowned. I spent the rest of the day pedaling to cover other temples until nighttime took me near the Royal Palace, where the adjacent Wat Mai monastery echoed the chants of the monks who were in prayers. 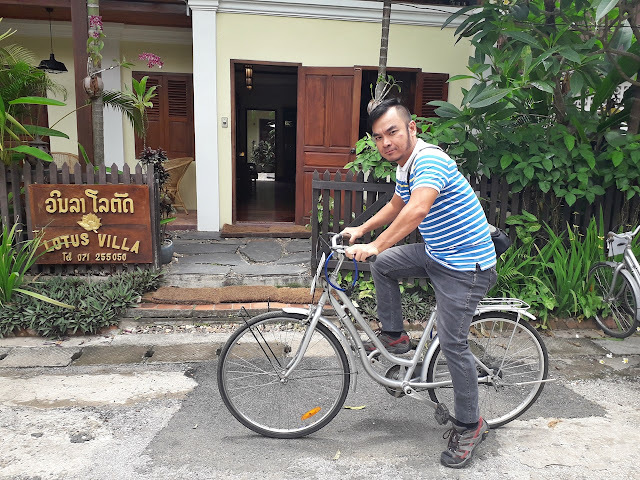 During daytime, I would take a break from my cycling explorations by hanging out at the many quaint cafés all over town. Colorful shops, restaurants and coffee shops housed in colonial buildings added a new layer of appeal. I would sit down and order a Laotian latte and just stare at passersby. 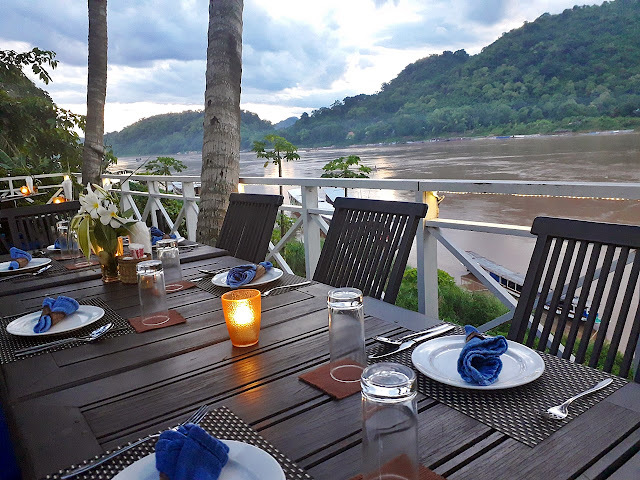 Nearing sunset, I would relocate to a riverside joint for an ice-cold Laotian beer while witnessing the sunset over the mighty Mekong River. “Duterte, Duterte!” a waiter at a riverside diner playfully chanted after I answered his question, “Where you from?” “Yes, he is our President,” I responded and then I took a moment to stop myself from sharing my unsolicited political opinion. The waiter proceeded to point out a standee of former US President Barack Obama drinking from a coconut. “That picture was taken here. Obama drank coconut here,” he proudly told me. It as it were, I was just checking out the menu and wasn’t decided yet where to eat, but the Obama connection convinced me to book a seat. I ended up having an unforgettable early dinner with a stunning view of the golden dusk sky reigning over the quiet waters of the Mekong. I capped my first visit to Luang Prabang by taking a short hike on top of Mount Phousi, a 100-meter high hill planted at the center of the historic district. As the clock ticks nearing my departure time, I spent a whole hour just staring at the lush surrounding countryside and trailing my sight to the adjoining water lines of the Mekong River and the Nam Khan River. Looking at the charms of the old town from above, I thanked the heavens for bringing me to yet another destination teeming with history and colorful culture. As a flock of doves flew over me and into the sky, I saw them leave a track of shadows over the greens until they all disappeared into the blue. About the same time, I felt all my worldly worries vanishing and was quickly replaced by a sense of tranquility. I knew then, Luang Prabang had me lured and secured in its enthralling embrace.